Our powerful BCAA powder (branched chain amino acids) with betaine will stimulate new muscle growth, halt protein breakdown, and hasten recovery. BCAA supplements stimulate muscle protein synthesis - the “engine” for sparking new muscle growth! Combats muscle protein breakdown and delayed onset muscle soreness (DOMS), for better recovery following tough workouts. Improves hydration, power, and endurance levels for greater overall athletic performance. 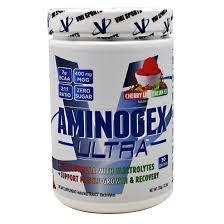 Aminogex Ultra™ contains 1.25g pure betaine for significantly greater strength during your gym sessions.